The composer and musician Claudio Monteverdi was baptised on this day in 1567 in Cremona in Lombardy. Children were baptised soon after their birth in the 16th century so it is possible Monteverdi was born on 15 May or just before. He was to become the most important developer of a new genre, the opera, and bring a more modern touch to church music. 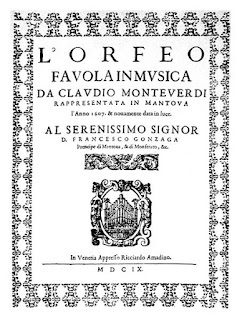 Monteverdi studied under the maestro di cappella at the cathedral in Cremona and published several books of religious and secular music while still in his teens. It was his first opera, L’Orfeo, written for the Gonzaga court, that really established him as a composer. In the early 17th century, the intermedio, the music played between the acts of a play, was evolving into the form of a complete musical drama, or opera. 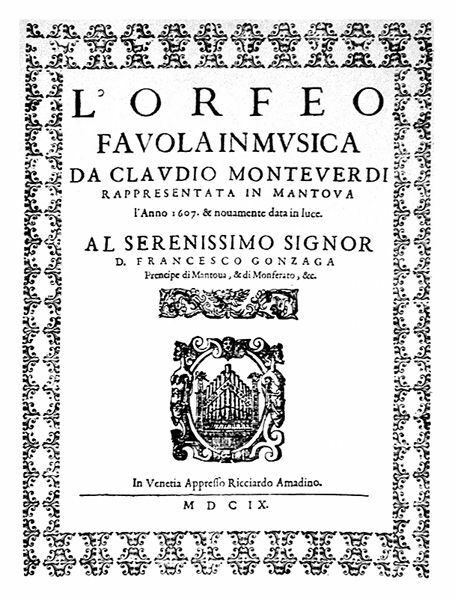 Monteverdi’s L’Orfeo was the first fully developed example of this and is the earliest opera still being regularly staged. It had its first performance in 1607 in Mantua. Two letters, both dated 23 February, 1607, refer to the opera due to be performed the next day in the Ducal Palace as part of the annual carnival in Mantua in Lombardy. L’Orfeo, or La favola d’Orfeo as it is sometimes called, is based on the Greek legend of Orpheus. It tells the story of the hero’s descent to Hades and his unsuccessful attempt to bring his dead bride, Eurydice, back to the living world. The libretto had been written by Alessandro Striggio and the singers were accompanied by an orchestra of about 40 musical instruments. It was staged again in Mantua and then possibly in other towns in Italy before the score was published by Monteverdi in 1609. There is evidence that the opera was also performed in Salzburg, Geneva and Paris from 1614 onwards. But after Monteverdi’s death in 1643 the opera was forgotten until a 19th century revival led to other performances. While it is recognised that LOrfeo is not the first opera, it is the earliest opera that is still regularly performed in theatres today and it established the basic form that European opera was to take for the next 300 years. A performance in Paris in 1911 gave L’Orfeo particular prominence and it has since been regularly included in the repertoire of opera houses. 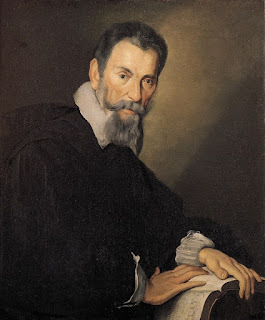 Nowadays, Monteverdi is acknowledged as the first great opera composer. 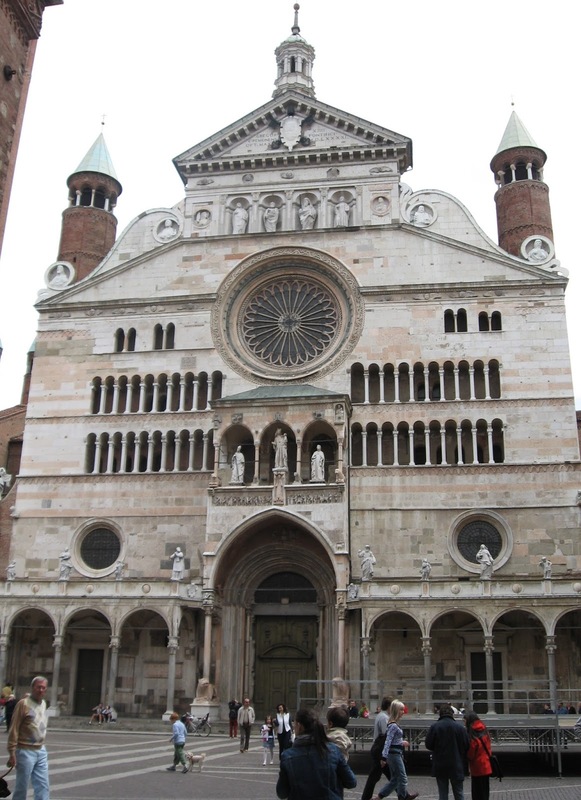 Cremona’s Duomo, where Monteverdi studied music, is an important example of Romanesque architecture dating from the 12th century. The facade with its large rose window was probably added in the 13th century. Linked to the cathedral by a loggia, is the Torrazzo, the tallest bell tower in Italy and the third largest in the world, standing at 112.7 metres. 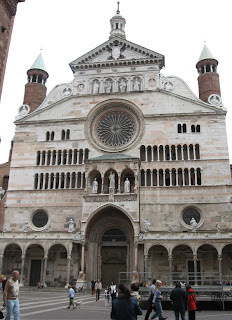 Work began on the Torrazzo in the eighth century and the spire was completed in 1309. Mantua is an atmospheric old city, to the south east of Milan, famous for its Renaissance Palazzo Ducale, the seat of the Gonzaga family, which has a famous room, Camera degli Sposi, decorated with frescoes by Andrea Mantegna. It is not known for certain, but the premiere of L’Orfeo may have taken place in the Galleria dei Fiumi, which has the dimensions to accommodate a stage and orchestra and space for a small audience.